In a large pan, preheat the 2 tablespoons of olive oil to medium heat for 3 minutes. Add the sliced chicken and season with 1 teaspoon cumin, 1 teaspoon garlic powder, 1/2 teaspoon paprika, 1/2 teaspoon pepper, 1/2 teaspoon salt and 1/2 teaspoon oregano. Cook for 8 to 10 minutes until the chicken gets a little brown. Add the onion, poblano, corn, garlic, and jalapeño to the chicken and cook for another 3 minutes. Add the salsa, stir well to combine and cook at a low simmer for 20 minutes or until the salsa reduces and becomes thick. Taste for salt as it cooks. Remove from heat and let cool for 20 minutes. In the blender, combine the avocados, sour cream, cilantro, green onions, 1/4 cup water and 1 teaspoon of salt. Blend on high until smooth. Taste for salt and set aside. In a large nonstick pan, add 1/4 cup of canola oil and preheat for 5 minutes at medium heat. Fill the flour tortillas with about 3 tablespoons of chicken and roll like a cigar as tight as you can, but without squeezing. Place them seam side down into hot oil. If you need to you can secure them with a toothpick. Cook for a few minutes, turning as needed, until light golden brown in most spots. Transfer to a plate lined with paper towels. You will have to cook them in two batches using the remaining 1/4 cup of canola oil. Serve with avocado sauce and garnish with diced tomatoes and cilantro. 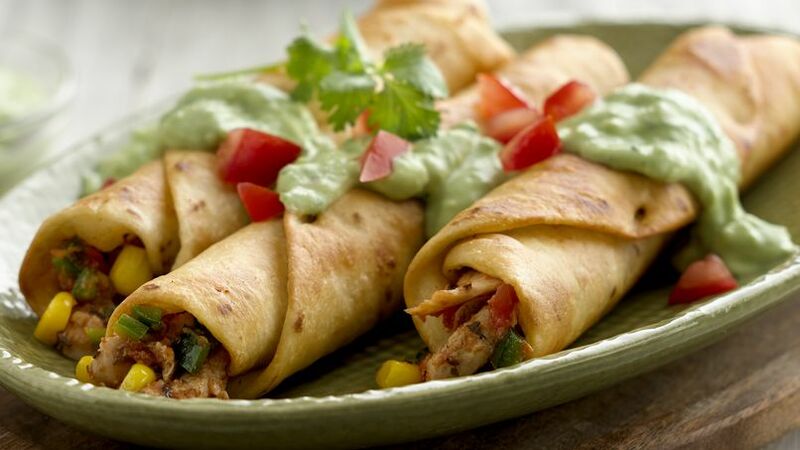 One of the keys to preparing a good flauta is soft tortillas and a filling that does not have a lot of broth. You can soften the tortillas by slightly warming them in the microwave before filling and rolling. Filled with chicken, shredded beef or cheese, flautas (the Spanish word for “flute”) are a fun and traditional Mexican antojito. As kids, my brothers and I would love when my Mom prepared chicken flautas. Not only did they taste delicious, but it was also a fun to pretend to play the flute as we enjoyed our dinner.